The period which began in about 200 BC did not witness a large empire like that of the Mauryas, but was noted for establishing intimate and widespread contacts between Central Asia and India. In Eastern India, Central India and the Deccan, the Mauryas were succeeded by a number of native rulers such as the Shungas. The Kanvas and the Satavahanas. In North-Western India, the most famous empire was that of the Kushanas. 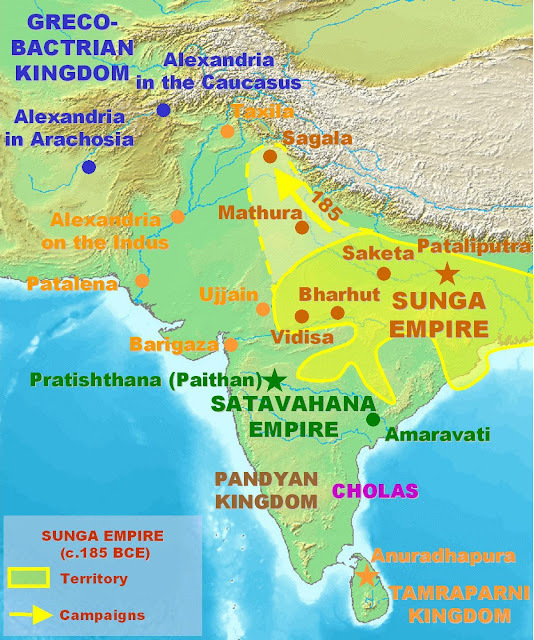 The Sunga Dynasty (185-75 BC):The Information about the Sunga dynasty is found in Gargi Samhita, the Mahabhasya of Patanjali, Malavikagnimitram of Kalidasa and the Harshacharita of Bana. The capital of the sungas was patliputra and vidisha. Pushyamitra Sunga, who assassinated the last Mauryan king Brihadratha in 184 BC, was the founder of the Sunga dynasty. According to the Puranas, Pushyamitra ruled for 36 years and his reign ended in 148 BC. The Great grammarian Patanjali was a contemporary of Pushyamitra. He is credited to repulse the two attacks of Greeks, one under Demetrius and another under Menander. Pushyamitra performed the Ashvamedha sacrifice. Pushyamitra was succeeded by his son agnimitra, who was the hero of kalidasa’s drama Malavikagnimitram. He ruled for 80 years. The next important ruler of this dynasty was vasumitra, was was the son of Agnimitra. The next important ruler of this dynasty was Bhagavat, who is identified with Bhagabhadra of Vidisha Pillar Inscription. The last king of this dynasty was Devbhuti. According to the Puranas, he was as incapable and ease loving ruler. He was put to death by his minister Vasudeva Kanva in 75 BC. Thus the Kingdom of Magadha was passed from the sungas to the Kanvas. The Sunga period is remarkable for the revival of Brahmanism and growing importance of Bhagavata religion. The Sunga Dynasty’s greatest achievement was the safeguarding of India from the invasion of Hunas. They valiantly resisted the Huna’s attacks and saved India from being destroyed. The Sunga period saw a flowering of the visual arts including small terracotta images, large stone sculptures and architectural movements such as the Chaitya hall at Bhaja, the Stupa at Bharhut and renowned Great Stupa such as Sanchi. Huans were one of the fierce tribes from central Asia. They had been invading India since the Sunga period. They were resisted by the rulers until the second half of AD 5th century. But the weakness of Gupta empire provided them with a chance to occupy Eastern Malwa and a good portion of Central India.